Tar Baby is a metaphor for a sticky situation, co-opted by the Ku Klux Klan as a racist insult. 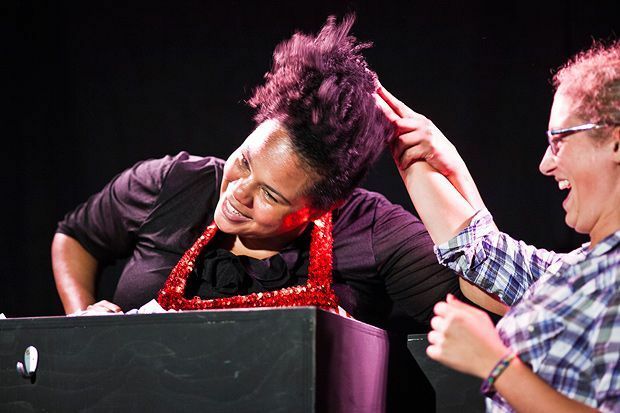 American performer Desiree Burch, who co-wrote this blistering piece with Dan Kitrosser, reclaims the phrase in a carnivalesque performance that is part autobiography, part history lesson, finally morphing into something unforgettable. Burch forces truth pills on the audience, both metaphorically and literally, initially in the form of cotton balls and packets of sugar, both symbols of black slavery. She is a sweet then sadistic ringmaster, pushing liberal guilt buttons to the point of discomfort. Towards the end, Burch delivers a scathing monologue that engulfs the audience in a tidal wave of rage at casual everyday racism and the recent cop killings of African-American citizens. Tar Baby is brutal and beautiful – often hilarious – and absolutely vital. Gilded Balloon, 622 6552, until 31 Aug (not 19, 26), noon, £9--£10 (£7--£8).